Disclosure: I did some freelance work for publisher eastasiasoft on the PS4 port of Rainbow Moon. I’ve had no involvement with the development of Rainbow Skies. Rainbow Moon was a strange beast. It was a game of epic proportions in a genre known for its storytelling, but the grandiosity of the thing couldn’t hide how forgettable the narrative was. At the same time, the combat and leveling systems were so intrinsically satisfying that it was easy to lose many dozens of hours grinding through an extensive array of post-game quests and challenges. It’s clear that developer SideQuest Studios took the criticism to heart, because they’ve gone to great lengths to improve things in Rainbow Skies. The things that worked well remain intact, but all those narrative elements have been overhauled, resulting in a far more enjoyable game overall. 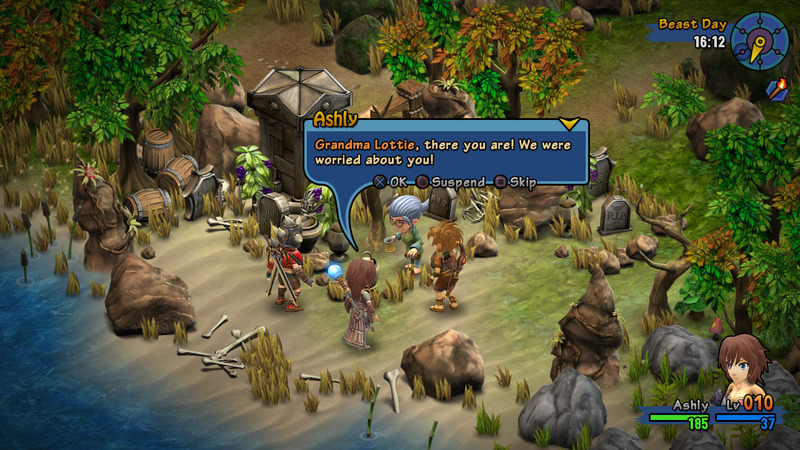 Rather than a direct sequel, Rainbow Skies follows a new group of heroes in a new world. Ashly, Damion, and Layne are the unlikely heroes, brought together by fate when a binding spell gone wrong leaves them physically unable to stray more than a few metres from one another. Nobody’s particularly happy with this arrangement, so they set out to find someone to undo the curse. As you’d expect, they end up getting swept up in something much bigger than themselves—this is, after all, an RPG. It’s an admittedly silly premise, but entertainingly so. Each of the protagonists is more of a caricature than anything else—Ashly with her happy-go-lucky naivete, Damion with his macho posturing, Layne with his short temper—and that allows for plenty of comical interactions between the three of them. Rainbow Moon attempted a similar style of goofball humour, but it often fell flat, but the much-improved quality of writing Rainbow Skies means the jokes land far more often. Without going too far into spoiler territory, the story itself is also far more interesting. The world of Rainbow Skies is split between the people who live on the ground and those who’ve settled on a floating archipelago called Arca. As far as the people of Arca know, the planet’s surface is nothing but a monster-filled wasteland; to those on the ground, Arca is seen as an opulent nation of crooks who happily plunder the land for its resources and thoughtlessly throw their rubbish overboard. 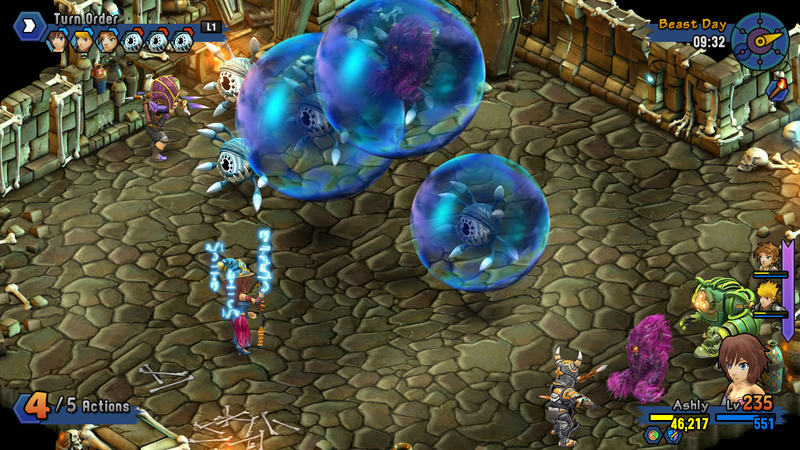 It’s the classic fantasy spin on a rigid class disparity, though in Rainbow Skies‘ case, this is mostly superficial. It would have been nice to see the game explore such ideas in more depth, but even without that, the unique setting allows for an entertaining romp. That becomes even more the case with a major about-face about halfway through, though I’ll say nothing more on that. 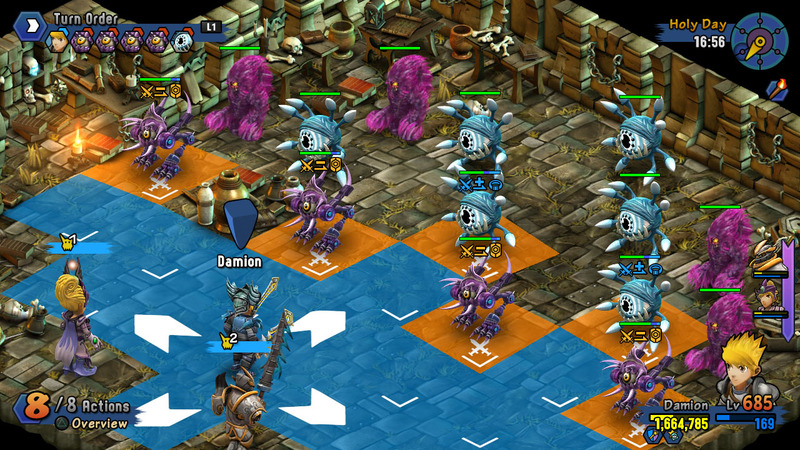 The highlight of Rainbow Moon was easily its combat: a spin on the grid-based tactical combat of games like Final Fantasy Tactics with a focus on smaller, quicker encounters. That system remains largely unchanged in Rainbow Skies, and that’s for the best. On any given character’s turn, you have a few choices about how best to use their stock of sub-turns. 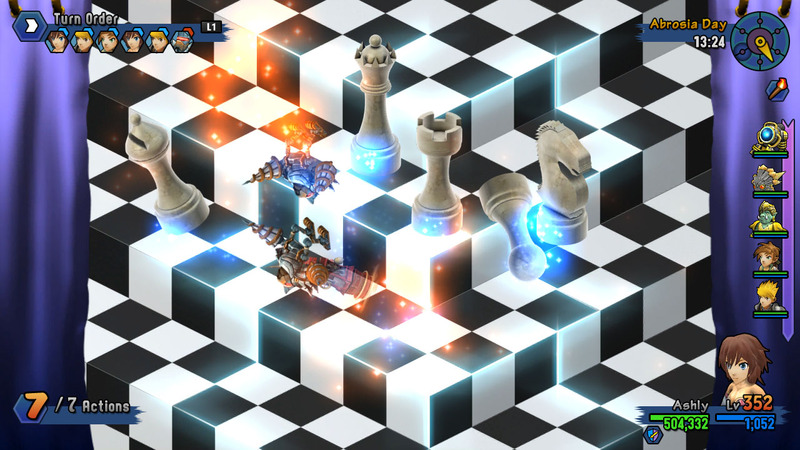 Moving a single square costs a single sub-turn, as does a standard attack—the more you move, the fewer attacks you get, and vice versa. Skills also consume sub-turns, with more powerful ones using more, forcing you to decide between, for example, using a weak Fireball spell three times or a more powerful Lightning Bolt once. Those skills come with all manner of creative area-of-effect patterns. 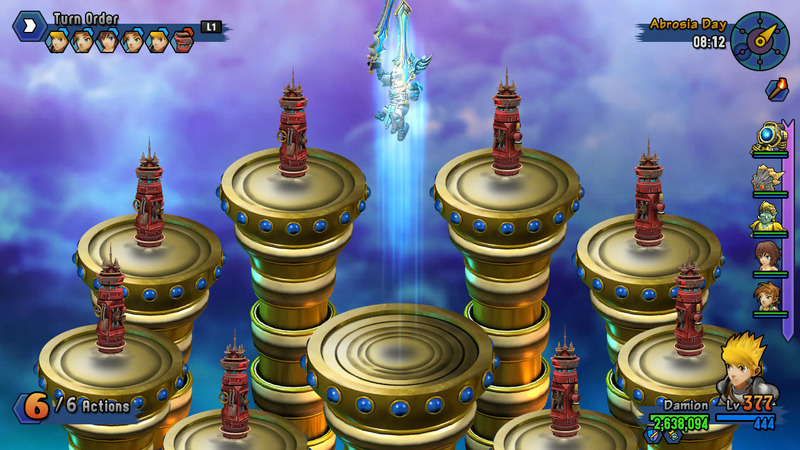 If you’ve played a few tactical RPGs, you would have come across the usual cross and line patterns for abilities that target more than a single tile; Rainbow Skies has those, but it also has odd wave patterns, pseudo circles, and the like. Each skill also has a specific range that’s usually fairly limited—some are short range, some are far, but few have the flexibility to cover both. As such, Rainbow Skies places a lot of emphasis on character positioning, as you try to get your heroes into the perfect position to unleash their hardest-hitting spells and then readjust with each new turn to account for enemies’ movements. This was all true of Rainbow Moon, too, and though Rainbow Skies doesn’t mess to much with that formula, it does tinker around the edges a little bit. The biggest change is the addition of a monster-raising system: rather than a bigger cast of predefined characters, you have just those three heroes, with monsters you’ve hatched and raised filling out the rest of your party. This doesn’t fundamentally change the flow of battle—monsters fight in exactly the same manner as the human characters—but it does give you many more options in terms of party configuration and adds a nice layer of collectability to boot. Another new wrinkle is the battle rank system. Fulfilling certain criteria—usually winning a set number of fights—allows you to optionally increase your battle rank, making encounters tougher, but with better rewards to be found. Should things get to tough, you can lower your rank at any time, but then you’ll need to go through the ranking-up process again if you want to increase it later on. It’s a neat way of adding an extra layer of challenge if you want it, or making grinding a little bit easier. Rainbow Skies similarly employs a lot of other small but welcome quality-of-life improvements and new features throughout the rest of the game—it still looks, feels, and plays like Rainbow Moon, but a more streamlined version. For instance, there’s still a two-layered levelling system where levelling up increases your HP and MP while Skill Stones are spent to increase other stats, but instead of having to visit a special NPC each time you want to do that, there’s now a menu option for it. Those Skill Stones are also easier to come by, now, and broken down into three rarities—common ones for a character’s primary stats, uncommon ones for secondary stats, and rare ones for special stats like sub-turns. Likewise, there’s a new system for learning magic, which involves learning base spells from books and then levelling those up through repeated use to unlock other, more powerful ones. Each character has access to a unique handful of different schools of magic—typically, some form of offensive magic and something more support based—and at higher levels, characters can pair up for combo skills. There are a few new minigames and sidequest types, such as fishing, treasure hunts, and single character arena fights, and there’s an expansive list of challenges tied to the game’s trophy system. More superficially, Rainbow Skies boasts far more imaginative animations for special attacks than its predecessor—often with humorous disregard for the internal consistency of the game world, like being teleported to a savannah clifftop so that an elephant monster can charge you off the edge of it. It reminds of JRPGs of the ’90s with its lack of care for suspension of disbelief in combat, and frankly, I love that. There’s a whole raft of similarly small but welcome improvements that I won’t go into lest this review start looking like a set of patch notes. Suffice to say, Rainbow Skies sticks closely to what made Rainbow Moon tick, while bringing in enough new ideas to feel fresh and ironing out some of the previous game’s more annoying quirks. It’s still a game that’s probably only going to appeal to people who really enjoy Japanese-style RPGs, but for people in the niche that it’s targeting, Rainbow Skies has plenty of enjoyment to offer. 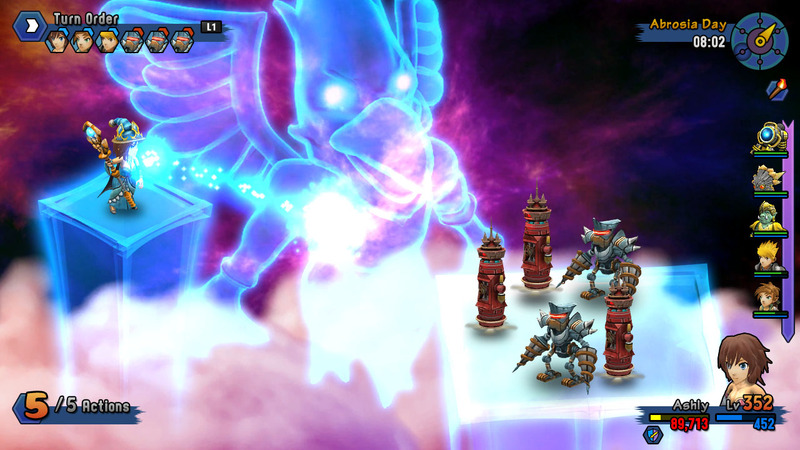 Rainbow Skies is developed by Sidequest Studios and published by eastasiasoft. It’s available now for PlayStation 4, PlayStation Vita (reviewed), and PlayStation 3.